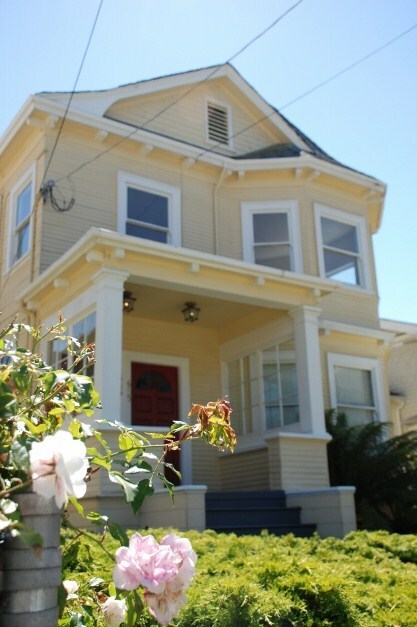 This delightful, generous Queen Anne Victorian abounds with period details and interesting transitions. The welcoming front porch leads to a formal entry and a series of arches visually uniting the large sun-filled living room with just as generously sized and bright formal dining room. With gleaming wood floors reflecting the light from many windows, the elegant pot belly iron stove adds to a cozy atmosphere of this lovely owner’s unit. The private space in the back features good size closets and plenty of storage, with mosaic tile on the bathroom floor and stained glass window. In the upper front unit the hallway millwork evokes a sense of history and dedication to craftsmanship. The space is comfortable yet efficiently designed with leaded-glass kitchen built-in, additional storage in the living room and original claw tub with hand held shower fixture. Located in the heart of Oakland near Berkeley Bowl, the high walk score offers attraction to passionate bikers and joggers, while easy access to freeways allows for easy commute to San Francisco.